With great potential, and fit for harsh terrains, comes the Airwheel M3, well designed for the rough streets of the city, keeping in mind the smoothness of the cruise! It has gained popularity because of its ultra-cool, huge sturdy wheels, which live up to its motto ‘For an Unbeatable Performance’. Specifically engineered for outdoor use, it can withstand adverse weather conditions too, retaining stability and balance of the rider even during sudden breaks. Not only is this electric skateboard rigid, but it is also extremely fast! It also has state of the art specs and high-tech features, which totally comes at a decent price. It can survive harsh amounts of downpour, and is splash resistant. What’s more, the M3 is suitable for all age groups. Is the Airwheel M3 Safe? How Cost Effective Is the M3? The Airwheel M3 reminds you of one of those RC cars, with huge wheels capable of overcoming any bumpy roads, and is shock absorbent. The handmade deck is made of advanced composite material, and maple wood, and is thin but strong. The rubber wheels are all terrain based, and by the looks of it you’ll know that they’ll keep you on the road no matter what. The board is heavy, but comes packed with world class power and performance. The board has built in damper masses, and can take up to 120 kg in weight. 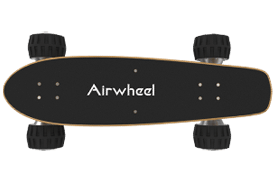 The Airwheel has smooth brakes, the motors are soundless; the board on the whole feels really durable and strong. It has an extremely stylish design, suited for both sexes, with one tail having giant wheels attached to the backward faced trucks. The motors and battery are in a scratch resistant encasing; the board has no external motor, and comes with cushioning risers. The M3 is popular for its undying performance on rugged and stony terrain, and has unbeatable potential under turbulence and raging weather. It gives you a speed of about 12 miles per hour, which may vary depending on the person’s weight, weather, and the road. The batteries are Lithium Ion, Sony cells, which take around two hours to charge. Although the maximum elevation it supports is 15 degrees, it can go up to 18 degrees in case of a light rider. The board has a dual core setup, with independent double circuits, which it makes it perform better and is smarter than other boards. This enables the riders to use the mobile app efficiently, where one of the chips relays the data to the app, while the other helps with balance and movement. The remote controller is rather simple to use, and has a good accelerometer, along with braking mechanisms- supporting 180-degree direction switching through the remote. The remote also supports bidirectional movement. The board works best when used in medium speed, which gives you a longer range before dying out. If you’re looking for a sturdy board, with a smooth cruise on all terrains, then the M3 is certainly the best you can get for the price range. Most of you may be concerned while using the M3 over rough patches and stony areas. This electronic long board was specially designed to keep the rider balanced and stable while progressing on to such places. 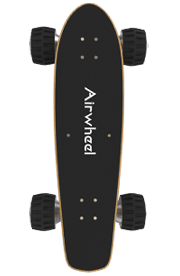 The deck is plastered with A-grade grip tape, and the wheels are cushioned to absorb vibrations, overcoming grit and rocks quite easily! Much like the traditional skateboard, the M3 automatically responds to shift in body weight over the board while riding. It captures the essence of a non-motorized board, and looks like one too! The wheels are water resistant, and anti-skid to give a smooth carefree ride during heavy rainfall. The best part about the M3 is that you can personalize it, to change the deck, add or remove the motors, etc. Thus, if you’re concerned about the safety that the given deck will give you, you can always use your own deck with grip that you are accustomed to. The M3 is extremely favored for its ability to overcome any terrain, with large wheels which look expensive, but are in fact quite reasonable. The whole setup requires assembling, so you’ll know what exactly your board is made up of, including how great it is in quality. It has full warranty, 1 year for the whole setup, excluding the tires and the cells. The rechargeable cells have a 6-month warranty, while the tires have one month. The box comes packed with the disassembled board, the remote controller, 2 batteries for the remote, one US grade charger, a user guide and the guarantee card. You can also link the board’s details to the mobile app, supported for iOS and Android phones– where you can track the range travelled, time used, the battery consumption, and also compete with fellow riders! The cost of the whole package comes to about $500, plus shipping charges. Considering the all-terrain wheels that it comes with, and built in dampers, this e-board is the most cost effective one in the market for its features. http://theelectricwheels.com is a participant in the Amazon Services LLC Associates Program, an affiliate advertising program designed to provide a means for sites to earn fees by linking to Amazon.com and affiliated sites.